A couple of weeks ago I was invited along to the Museum of Science and Industry to learn how to save money by driving more efficiently. Not the most exciting invitation you might think, but I was keen to learn how to save money. Every little helps, as they say and I resent having to pay the inflated fuel prices at the pumps. Johanne Smith from Shell, and Quentin Willson doing jazz hands. Johanne told us that only 25% of fuel is used efficiently in a car engine and so Shell wanted to develop a fuel that helped to use some of the wasted 75% and Fuelsave is designed to leave fewer deposits on the engine which makes it run more efficiently in the long run. using the air conditioning uses up to 10% of fuel energy. Opening the windows uses up to 5% because of drag. Avoid both if possible but if you can't stand it, open a window rather than using the AC. Basically, the bottom line is that every time you use the brake pedal you are wasting fuel energy. The key is to read the road ahead - for example by slowing down before roundabouts and traffic lights instead of braking suddenly when you actually reach them. Seems so obvious doesn't it? But how many of us do it? don't keep 'stuff' in your car, get rid of unnecessary car clutter - all that extra weight is making your car engine work harder. So, there you have it. 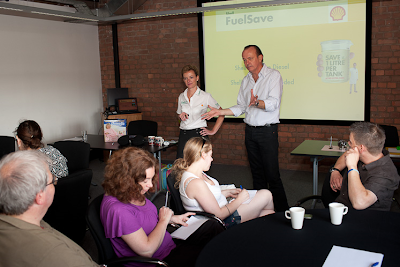 Shell Fuelsave, can it save you money? Well I'm giving it the benefit of the doubt and I've started using it because a) it's the same price as standard non-leaded, and b) anything that promises to save me money is onto a winner with me. And Quentin's driving tips? My average MPG is up from 38.7 to 39.8 and rising. I'm a happy driver. Disclosure: I was invited to the event and given lunch. And a driving lesson!